It was a really tough decision to choose between Petra and Timea first up on the schedule but in the end I went for Timea’s match since i’ve never seen her play a competitive match. I wasn’t a lucky charm though as she lost her first match on grass! 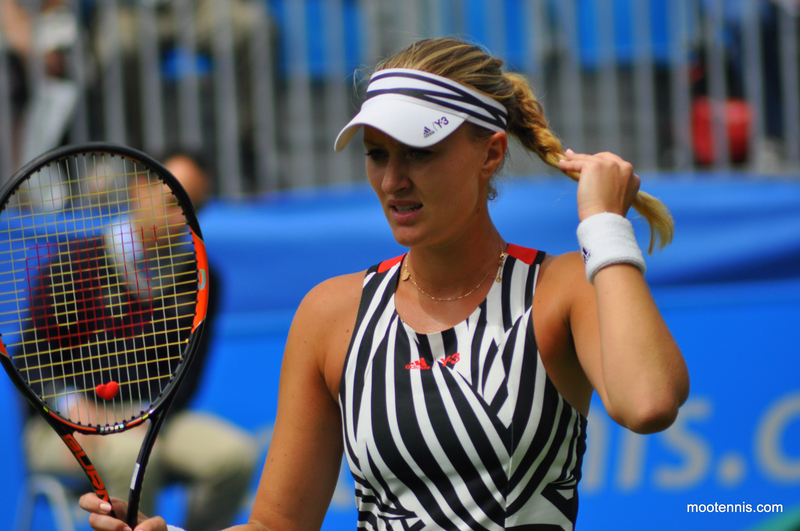 Kristina Mladenovic defeated Bacsinszky, 6-1 7-5. Bacsinszky made a very slow start, spraying groundstrokes (mostly forehands) and struggling for rhythm on both serve and return. On the other hand, Mladenovic showed the sharpness of a player with many matches on grass and she was rock solid on serve. Bacsinszky was marginally better in the second set but still couldn’t get meaningful returns into play. Mladenovic had the early break, but with a mixture of the wind and nerves, wobbled up *4-3 in the second set. Bacsinszky had her best period of the match, hitting much more consistently (LOVE that backhand) to go up 5-4. I thought Mladenovic may wobble serving with scoreboard pressure, but she didn’t. In fact, Bacsinszky became increasingly error-strewn. The Swiss player was broken again at 5-5 and Mladenovic served it out to 30 in confident fashion. Loved the net exchange and was chuffed that Kiki retweeted it on Twitter! I also saw Kiki and her family at a restaurant in the evening. I see her brother everywhere! I then managed to sneak a few pictures of Petra through a gate entrance. I got to see a passionate Petra pojd! She beat Timea Babos in two tight sets, 6-4 7-6(5). I’m hopeful i’ll get to see more of Petra tomorrow or at Wimbledon. I might have left tomorrow before she starts her match against Johanna Konta. Then it was over to court two to see the conclusion of Yulia Putintseva v Kateryna Bondarenko. Poots at any time is fun but deep in a third set? Yes please! Within a few points of watching she was already madddd. The racquet went quite a few times and on another occasion, she dropped her racquet to the ground and stomped her feet. I think it was her shoes… or the grass… or just general life that was bothering her. I do admire her game style though and she’s super fun to watch live. Bondarenko maintained her aggression and didn’t waver at the end despite missing two match points to eventually win, 6-2 4-6 6-4. Poots was MAD at the end. Note in the pictures below that she’s not holding her racquet haha The umpire’s chair obscured my view but she slammed her racquet into something on multiple occasions at the very end. Next up was Dominika Cibulkova against Jelena Ostapenko, which was a must watch out on court 4! Both players have pretty similar game styles and there were some hard hitting rallies. When I joined the match towards the end of the first set both were a little error-strewn, but it picked up in the second set. Cibulkova won the first set but Ostapenko got the early break in the second set… this didn’t last long. Cibulkova was a tad more stable despite some flashes of brilliance from Ostapenko. I tried to watch a bit of Eugenie Bouchard’s match against Irina-Camelia Begu but court 2 was packed, the busiest i’ve seen it this year. Generally though the outside courts haven’t felt as crowded as previous years. 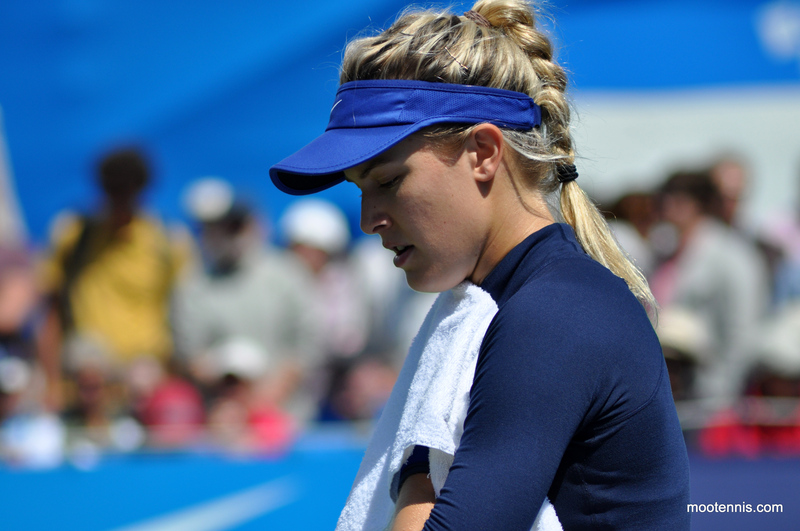 Bouchard defeated Begu, 6-3 6-1. I’ve predicted Bouchard as my champion for Rosmalen and Mallorca and had her out round one in Eastbourne… well done, James! 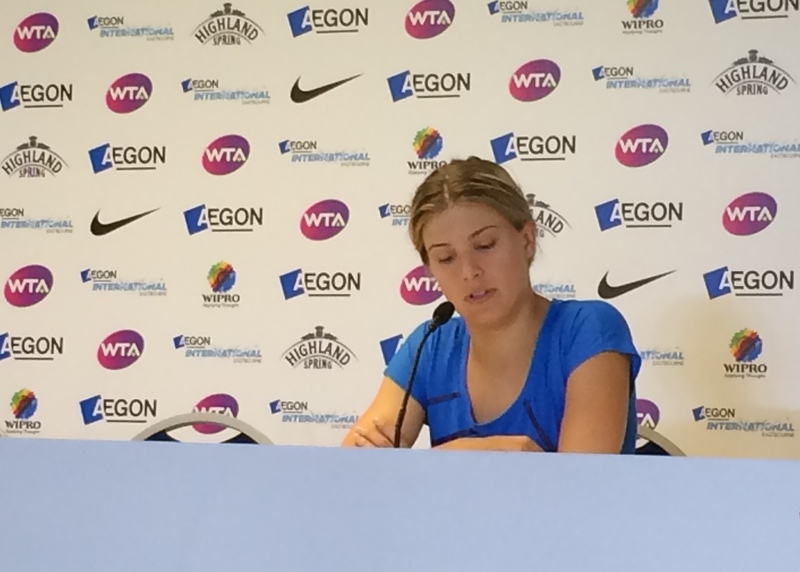 I did manage to make her press conference and Genie was understandably content. 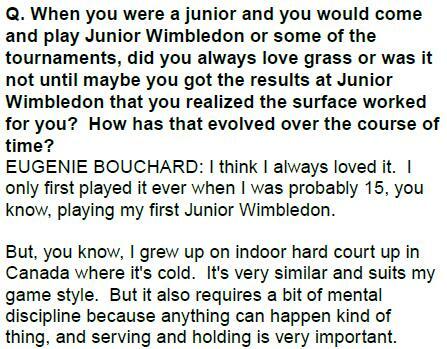 She talked about some of the players she has practised with on the grass (best buds with Hantuchova!) and why she likes grass. Part 2 of Tuesday’s round-up is on the way! 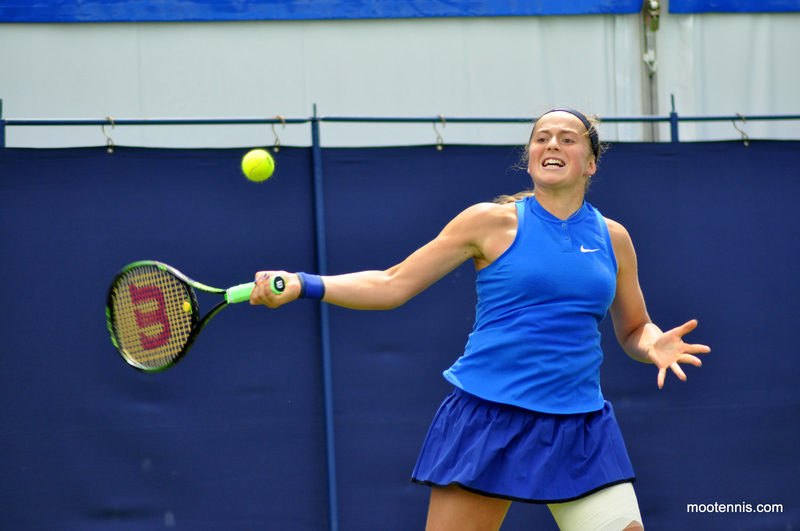 June 21, 2016 in Eastbourne, Tournament Report, WTA. Kristina Mladenovic seems to be an improving player ( at singles as I know that she is good in doubles ) and could get her first WTA title in the next 12 months. I have not seem much of Yulia Putintseva until the last few weeks and she seems to be a bundle of energy and I like watching her so it must have been entertaining to have seen her here. I’d like to see her play against Daria Gavrilova as I think it would be a fun match. She has beaten Daria three times out of three but Daria is better nowadays so it could be close. Well I’m hoping Monica Puig beats Kristina Mladenovic tomorrow personally. I think she’s just a more complete player and could be a legitimate contender at the Slams over the next few years if she keeps playing like she has the past couple of months. Her win at the French Open against Goerges is by far one of the most impressive of the year for me.